He’s teased us from time-to-time with glimpses of real SuperCoach star potential, but Alex Twal has yet to elevate himself from the mid-40 PPG average FRF quagmire. 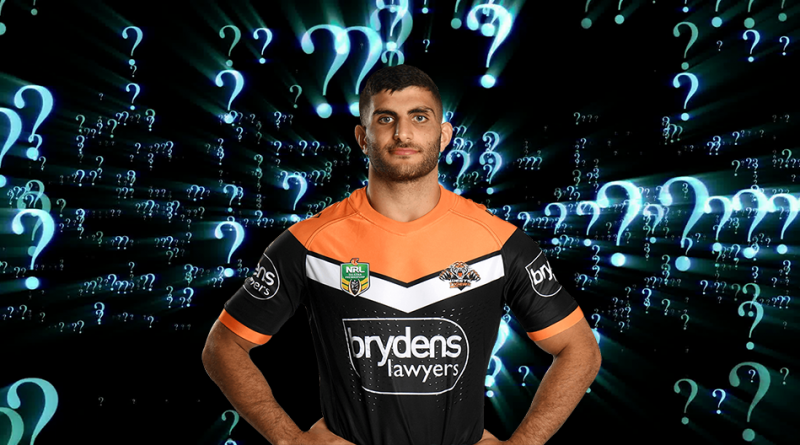 Twal seemed to be headed for a massive 2018, but the recently departed Wests Tigers coach, Ivan Cleary must have missed the 2017 world cup where Twal played massive minutes for Lebanon and his workload didn’t suffer. This is exactly what we want to see from a developing FRF on the world stage. What’s even more impressive is the fact that 90+% of his output is from pure base statistics. With the exits of Tim Grant and Sauaso Sue and a new coach on the scene, Twal will hopefully be given more of an opportunity to shine in 2019. If we are to be guided by past PPM rate, which is a very consistent 1.15, and assuming that he can increase his minutes to 50-55 MPG, this could see him average between 58-64 PPG. An average like this would certainly see him elevated out of that quagmire and into legitimate keeper territory at the FRF position. However, it should be noted that in 2018 when he played in excess of 40 MPG his PPM dropped from 1.15 to 1.03. He’s gathered my interest this pre-season, what about you? Would like to find those stats from his big minute performance. Your right, there’s no real standout or depth in the middle for Tigers. Eisenhuth, ET (Is he in the outer? ), Matterson, (seriously, is he really a middle player?, can his body handle the workload there? ), Rochow (I just threw up in my mouth), Mutalino, Musgrove, Packer & Twal. There is potential there for someone to pick up some work if they step up. The other one that interests me is Musgrove. A bit of a bad boy but has played under Madge before, great ppm. How’s he looking OTB? Personally I would go with mikeale who should get a run on the bench , Musgrove will be great for SC but he might have to earn his spot first . I don’t know about you @Bear but to me Matulino, ET, Packer, Eisenhuth, Twal etc is a lot of depth in the middle. I brought up Matterson because he’ll be playing on an edge, and most likely be playing 70-80 mins, therefore, that limits the number of minutes on offer for other players in the pack. Yeah the depth is there I guess, what I’m saying is that it’s not really that strong of a pack and besides maybe Packer and Matulino, they’re all dispensable. If a player like Twal can step it up then he can easily better his 37 minutes. Also a new coach so those minutes are debatable. It all depends on TLT, were all clutching at straws atm. Are you assuming ET gets 60 again or will they give twal the spot and ET the bench? Also eisenhuth could be in reserve grade mate. You are speaking like he is replacing Vaughan Fifi kapow. Are you assuming that Twal is going to get the minutes you think he’s going to get? Are you assuming that Eisenhuth could be in reserve grade? You are speaking like you know what Madge is going to do. You’re speculating again – you’re hopeful that Madge is more consistent – you don’t really know if he will be. I don’t know what the minutes are going to be for all the middle forwards, I’m just pointing out the minutes they played last season to illustrate the depth they’ve got. But just because Tigers fans want him, doesn’t mean it will happen. What is been happening at pre-season? My mail is that Eisenhuth will start at lock with EJ on the bench. My mail is 1 experience and one rookie rotating at prop as well wenin. As @2 pointed out, it doesn’t matter what the fans want, or who you believe is the best forward in the pack. All of what you’re saying is based on what you want to happen, which is fine, but it has little relevance when discussing what is actually going to happen. I know I’d much rather spend my money on players in the same price range (or cheaper) who’re going to start and get significant minutes, rather than speculate on players who may or may not start, and may or may not get significant minutes. Twal fits into the latter category. That’s half the battle but Flock. Last year everyone said that Cook, TPJ, Matterson, Tevega, Kikau, Arrow weren’t good options because their minutes were to speculative. Players like Latu, Smith, Carty, Gallen, were good options. If you picked the first lot of mentioned players over the others, then you were killing it. What is actually going to happen? No one knows so we have to consider the Twals and other diamonds in the rough who MAY get more minutes. I’m by no means saying not to consider the likes of Twal, I’m just pointing out that there are players around his price range who ARE going to get way more minutes, and do have stronger job security. You’re most definitely speculating. You don’t know what Madge is going to do. I don’t see how bringing up the point of him averaging more minutes in 2017 than he did in 2018 means he’s going to play more minutes in 2019. That’s not the pattern. And look, I’m not starting he won’t or he will play more minutes than last season, all I’m saying is, you’re speculating on how many minutes he is going to get, especially when there’s seemingly a lot of competition for minutes in the middle. There were 4 games and a demotion midseason that dropped his AVG mins otherwise his AVG mins would have been over 40, that’s an extra 4-5 pts in itself . Anyway flock is quick to point out CS9 playing a 30 min game but not twal. My opinion is he is 12-15 pts undervalued ,there’s no reason why he can’t score 55-58 if he does get his mins up from 36.8mpg to 47 min at 1.2ppm. Just throwing my two cents in whats to say Madge sticks with Matulino and Packer to start?? Could Twal start? should def see bigger min then? Packer is aggressive , mats just hadn’t been great since the warriors days . Madge likes go forward and twal runs 100+ every game . If that were the case, I’d be bitter towards every Tigers player, considering your entire team destroyed us in R6 last season. We’ll be getting payback in R1. In my short SC experience, I’ve found the game is more than just numbers, sometimes it’s about going with gut feel – that could be through seeing a little something in a player most others had missed or just plain luck. In saying that sometimes numbers speak louder than words. I’ll have an eye on Twal but won’t be grabbing him early season. Selections are most definitely more than just numbers, however, I’m not entirely sure @15296 would still be making this POI if this was another forward on another team in a similar situation. Seems to be a little bit of orange and black in this “gut feel”. Theres a lot of potential in that tigers pack, and I will be keeping a very close eye on them early to see who Madge favours. But picking out that one with only trials to go on seems a risk not worth it for me. Hopefully Madge is more decisive than Cleary was.